No payment. No obligation. Full support. Addy helps New Zealand businesses to create a delightful digital experience. The key to success and repeated online sales is to deliver value to your customers by optimising your checkout process, respecting consumers' time by enabling them to complete transactions without friction and guaranteeing that parcels will be delivered. Fuzzy address matching that will correct typos and mistakes, based on a relevance score, to push better matches to the top of the list. Find NZ post codes and addresses to maintain an accurate customer database for better decision-making and marketing. The latest address data sourced from NZ Post's Postal Address File (PAF), LINZ and more. Find and capture postal or physical street addresses on your website, Apple app or android device. Users will be delighted to have their delivery address entered fast and validated in real time to boost confidence that orders will be shipped to the right destination. Check addresses accuracy at the point of capture, reducing the need to clean your database. Suggestions are prioritised based on IP locations to display the right address with less keystrokes. Our customers range from small businesses to large enterprises. They trust Addy to lookup millions of NZ addresses for essential delivery efficiency and increased cart conversion rates. Boost cart conversion rates and increase delivery accuracy with Addy's Shopify address autocomplete plugin. Reduce friction and speed up the checkout process; use the copy-and-paste BigCommerce integration guide. Increase entry speed by up to 80% - follow the step-by-step WordPress and WooCommerce instructions. Show customers that you respect their time with a streamlined checkout experience. 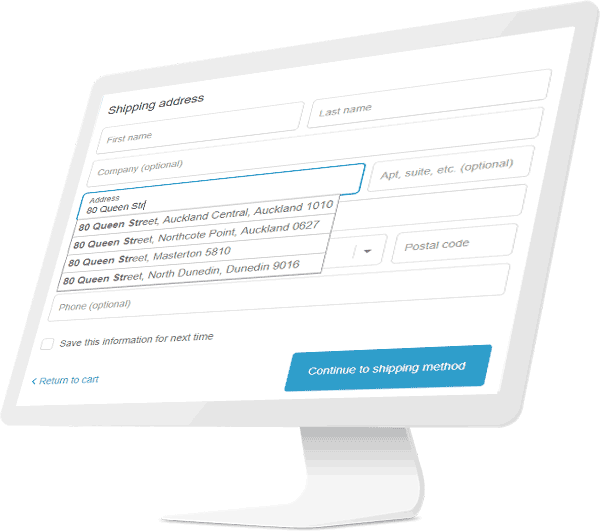 Make it quick and easy for users to fill in their delivery details accurately, reduce cart abandonment rates, save money on missed deliveries and remove the complexity of scrubbing address entries in your database. Our cloud-based predictive search and address validation technology evolves continuously through innovative practices, improving an already excellent user experience. We analyse thousands of address queries to cater from standard to edge-case search criteria that will locate the right destination even when spelling or categorical entry mistakes are made. Extensive research was conducted by evaluating the biggest national and international address providers and we've succeeded in developing a superior, industry leading intelligent address finder.